Auto Tech Services (ATS) Collision Repair Center in Mansfield has served local residents in and around Mansfield with expert auto body repair services for over 15 years. From comprehensive collision repair to car dent removal to custom auto painting, our full-service auto body shop in Mansfield does it all. To schedule an estimate or learn more about our services, call (817) 405-3444 today! Our highly skilled and experienced auto body repair technicians are certified by I-CAR, the standard-setting organizations for automotive repair excellence. We repair any make, model and year with 100% satisfaction guaranteed, and we'll work with your insurance company so you don't have to. Enterprise Rent-A-Car offers pickup and delivery at our location, and we've earned an A+ rating with the BBB. From minor door dings to big dents, our auto dent repair technicians carefully and completely restoring your car to streamlined beauty. We can restore any panel of your vehicle's body no matter how badly dented, repairing or replace parts as needed and finishing with custom paint that's sure to impress. 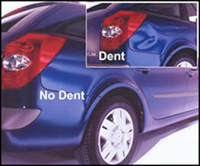 For expert dent repair from a full-service auto body repair shop providing reliable and exceptional dent removal and collision repair in Mansfield for more than 15 years, call Auto Tech Services Collision Repair Center at (817) 405-3444 today, or visit our shop to schedule a dent removal estimate.